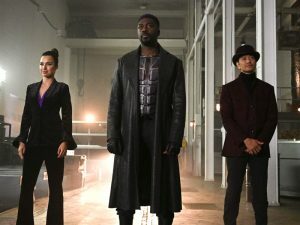 Manchester Black assembles a team of super-powered criminals to go after anti-alien forces, prompting Supergirl to call on her own super-friends to stop him. While Nia trains with Brainy at the Fortress of Solitude, Lockwood learns that he may be losing the people's confidence. Last edited by GateWorld; March 29th, 2019 at 09:48 PM. SG1: Ark of Truth: MGM Stargate: Get the Truth - Submit Questions to RC Cooper!